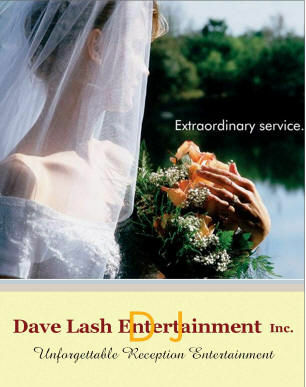 DJ Dave’s Picnic Tables – Dave Lash Entertainment Inc.
1. If it doesn’t say 3″ deck screws…it isn’t. It is probably nailed together. That means that as the table “flexes” when you sit down, those nails will eventually work themselves loose and become a rickety table. 2. The top boards need to be gapped from 1/8″ to 5/16″. This will prevent rotting when the boards are “butted up” to each other and the moisture is trapped between boards. 3. The bottom of the legs need to extend to at least the center of the seats, not short of ….or your table may tip backwards when you sit down. 4. The tops and seats should not be made with pressure treated lumber. Why? Pressure treated is designed to protect against moisture…not the sun. What this means is that the top and seats will eventually “curl” at the top surface dries while the backside is wet. Eventually, (unless painted or stained heavily immediately) this will look terrible. A perfect example of this is the picnic tables at McDonalds in Belchertown. All 3 are rickety and curled up badly…and they’re not that old! 5. New pressure treated lumber is also poisonous ….if you get a nasty splinter, watch out! 6. In my opinion, every outside corner should be trimmed (so no one will hurt themselves by bumping a corner). I even chamfer the bottom of the feet to resist chipping if dragged on the ground. 7. If you choose to paint your table, be sure to go over every knot (or the whole table) with an exterior primer sealer 1st. This will prevent or severely reduce the knots from “bleeding” through the soon applied “decking – not siding” paint (Good for 8 – 10 years or more with a quality brand). 8. If you stain your table, use a “decking” stain. Full color last almost twice as long (5 years) as a semi transparent stain (3 years), but the semi looks nicer (you can see the grain of the wood). Spraying it on looks great, but you lose over 50% of it in the air, while a brush doesn’t. 9. If you are considering “Thompsons Water Seal”, you need to treat your table every 12 months. Why? All this does is coat the table with a wax substance as the protectant…and it slowly wears down in that time period. Be sure to put an extra coat of paint or stain on the bottom “feet” of the legs touching the ground. Why? When wood is cut, the ends are like straws that can soak up moisture from the ground which can eventually rot the feet over time. Coating it with stain, paint, or even putting the legs on blocks flush with the ground will slow this problem to almost a halt. I suggest paint / stain the bottom side first from the center of the table to the outside, then the feet again, then flip the table over and blend in any runs while coating the seats and tops. I usually use a quart to do up to an 8 ft table and about an hour of your time and take your time. It is very gratifying when your table is done! Remember – these tables are “unfinished” and ready for stain or paint! I’ve seen these tables last to 30 years (or more)! Usually these table are dry and ready to be coated right away. *Note – I use Grade 2 pine (What you use at Lowes or Home Depot.) This will have some knots, some minor cracks, maybe some bark (I usually sand off), some checking. The decking screws are not hidden underneath to “hide” them. I do not usually stain or paint the tables because of friction issues when delivering them and have some of the paint or stain rub off or chip because of the tie down straps of moving them. I can use Grade 1 wood, but your costs just went up 60% and no guarantee that it won’t crack in the future….so I don’t offer it . My opinion – You are getting a nice table at a nice price locally. Believe it or not, I build these tables to keep me busy during the week during the summer while I work my Mobile DJ, Photo Booth, and Game Show Entertainment Business on weekends. A great hobby that I learned back in 1993 from my friend Jim Loranger who’s family been building them for up to 40 years earlier in their front yard. I am happy making all my customers, clients, and families pleased with my services. If you are happy, then I am happy. That is my commitment to you! Call for a delivery or for pick-up time.